CONTACT US - Just Say Gnome! HELP US GET TO GNOME YOU BETTER! 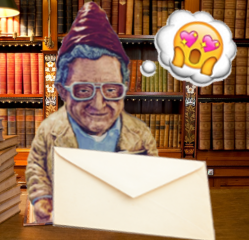 Please send any questions or Gnome-related concerns our way and we'll do what we can to help you. IMPORTANT SIDE-NOTE for Ordering: * Over the last year I've come to discover that several of my email responses were somehow diverted to recipient's email 'spam' folder - so if you haven't received a response back from me within a few days to a week please do check your spam folder as that's most likely why.